Mazama, WA in Okanogan County is a popular destination for outdoor lovers. Nestled on the eastern slopes of the North Cascades, it’s the closest settlement to the summit of Washington Pass, making it the perfect base for your mountain adventures. The largest cross-country trail system in North America, Methow Trails traverse the picturesque Methow Valley and an unending network of trails in the North Cascades. In the summer, the trails make scenic bike routes, covering hundreds of miles of back roads that range from smooth unpaved tracks to high alpine paths. Hiking is another popular summer activity on Methow Trails. There are numerous hiking paths, including short, wheelchair-accessible trails and longer, more strenuous routes that can take days to cover. You can also go horseback riding on these trails. Bring your own horse or go on a guided ride offered by lodges and outfitters in the area. In the winter, Methow Trails turn into a world-class cross-country ski trail system, featuring four areas connected by the Methow Community Trail. 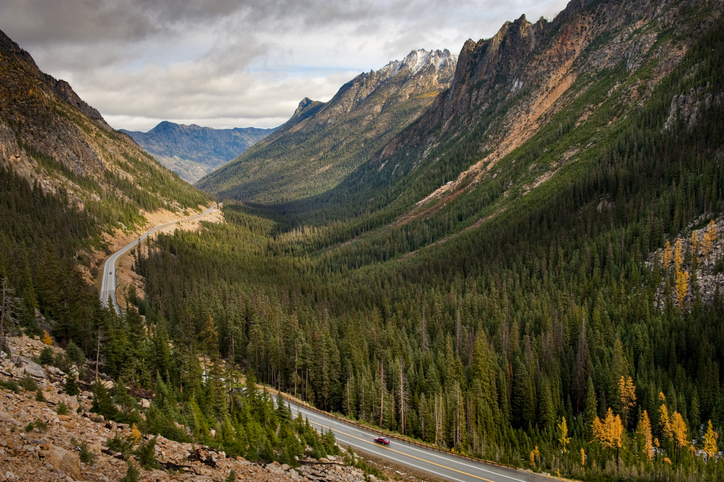 This 440-mile highway goes on a loop around the North Cascades and passes through numerous scenic towns, including Mazama. National Geographic has called it “one of America’s grandest, most spectacular drives.” The loop takes you through the diverse breathtaking landscapes of Washington, with views of majestic mountain peaks, refreshing rivers, lush forests, sage desert, orchards, and more. On your road trip adventure, take the time to experience what each community on the loop has to offer. Depending on the time of the year, you can enjoy local festivals, cross-country skiing, hiking on peaceful trails, and so many more. Mazama is a great stop for these activities, as well as for refueling and recharging. Enjoy the local restaurants, quaint shops, and cozy lodging in the town before you embark higher up the North Cascades. The Methow River is a tributary of the Columbia River, and features pristine, clear waters teeming with fish and other wildlife. The river’s banks are mostly part of national forests and wildernesses, which ensures their preservation. Flowing just south of Mazama, the Methow River is visited year-round by anglers who come for the abundant supply of trout and salmon. In the summer, these anglers are joined by campers, hikers, bikers, and other outdoor enthusiasts. Found on the east slopes of the Cascade Range just north of Mazama, the Okanogan-Wenatchee National Forest covers 4 million acres of pristine wilderness. It features developed campgrounds, fishing and hunting grounds, and miles of hiking, mountain biking, and equestrian trails. There are plenty of opportunities for climbing, off-roading, bird watching, sightseeing, and other activities. In the winter, the forest is a popular spot for cross-country and downhill skiing, as well as snowmobiling. Living in Mazama, you can enjoy all these great outdoor adventures anytime you want. Explore Mazama real estate and find the perfect mountain home for you. Looking to buy or sell a home in Chelan, Manson, Orondo, Brewster, Pateros, Twisp, Winthrop, or other nearby communities? Get in touch with Coldwell Banker Lake Winthrop Realty at 509-996-2121, or send an email to info(at)cbwinthrop(dotted)com.